“StreamIt’s media management service helps us get video content online and in real time for our TIGERS Team Culture coaching programs. It is also providing the system for secure delivery of our video content for our global online classrooms. We needed an efficient way to share our content and to support the next phase of our business growth as a company,” said TIGERS Success Series founder, Dianne Crampton. Author, speaker and organizational leadership expert Dianne Crampton has spent 20 years studying and analyzing how business team culture works as it relates to a committed and engaged workforce. She has a proven track record of turning troubled companies and organizations around with six key, collaborative principles anchored by teambuilding behaviors she calls TIGERS: Trust, Interdependence, Genuineness, Empathy, Risk, and Success. To learn about the book, TIGERS Among Us - Winning Business Team Cultures and Why They Thrive (Three Creeks Publishing March 2010) join the call by phoning (218) 339-4600 and use the pin number 174287 followed by the # sign. 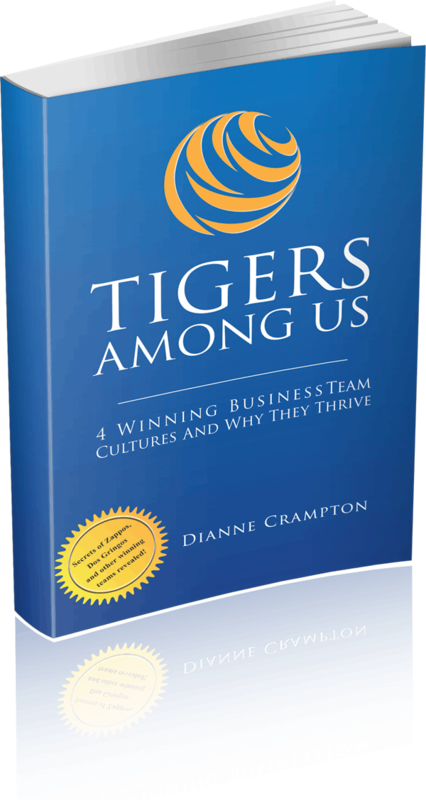 Business team culture expert Dianne Crampton of Bend, Oregon and author of TIGERS Among Us: Winning Business Team Cultures and Why They Thrive, is among the tens of thousands travelers who have found themselves stranded in Europe due to the Icelandic volcano eruption. Crampton was in Europe taking a look at team behavior in certain business operations on the continent. The prolonged airline chaos gave her a chance to observe up close and personal institutional responses to a crisis for which airlines and governments were clearly unprepared to handle.